BILTMORE REGENCY is one of the few single story end units with one of only five double master floor plans and is steps away from the pool, spa, tennis courts and BBQ /bar/outdoor kitchen. 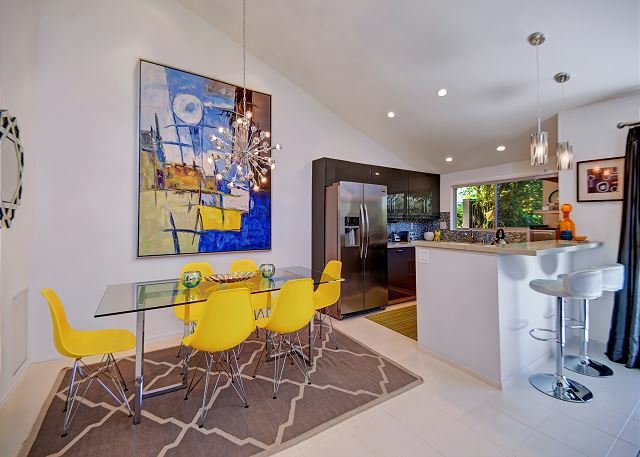 This unit has an open floor plan easy to entertain in and is flooded with natural light from the vaulted ceiling and clerestory window. The furnishings are bright, energetic, and make a beautiful backdrop for any photo opportunity yet at the same time inviting and comfortable. The light and airy living room is a treat to the senses. Splashed in color and full of personality the main room has ample seating, a 60” HDTV with Blu-ray/DVD player, and bold carefully chosen accents to compliment the space and furnishings. 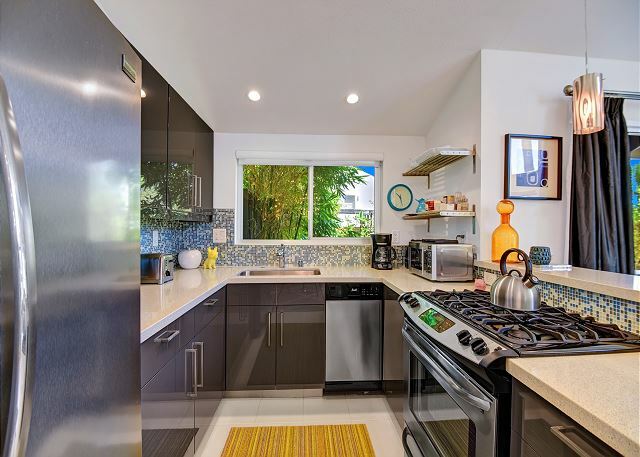 The European style kitchen with quartz counters and higher end stainless steel appliances is fully stocked with everything you could need or want to prepare and serve meals. You can enjoy those meals – or coffee or cocktails – at the breakfast bar, 6 person interior dining table, or on the private patio with mountain and greenbelt views. With two master suites – both with King sized beds – this unit is perfect for two couples. Each bedroom has a 40” HDTV with Blu-ray player with built in apps for streaming, ceiling fan, coordinated window treatments, high quality linens, and designer lighting. 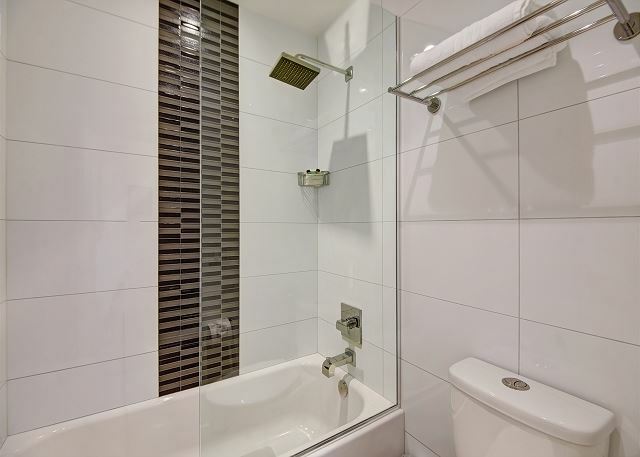 Both en suite bathrooms have rain showers, floating vanities with double sinks and designer glass tile. One bathroom has an oversized walk in shower and the other has a shower/tub combination. 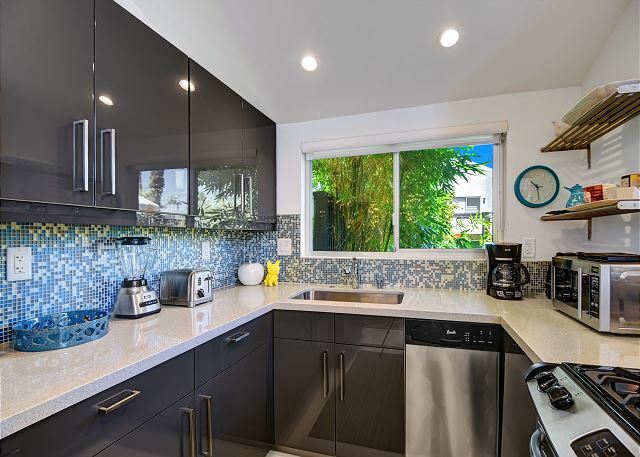 Some other modern conveniences: stackable washer and dryer in the unit with provided detergent, bleach and dryer sheets, wi-fi, phone service with unlimited long distance to US and Canada and. 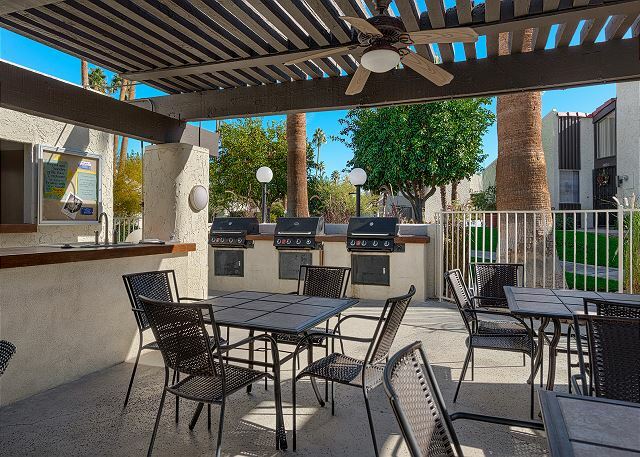 There is ample uncovered parking for renters and their guests. 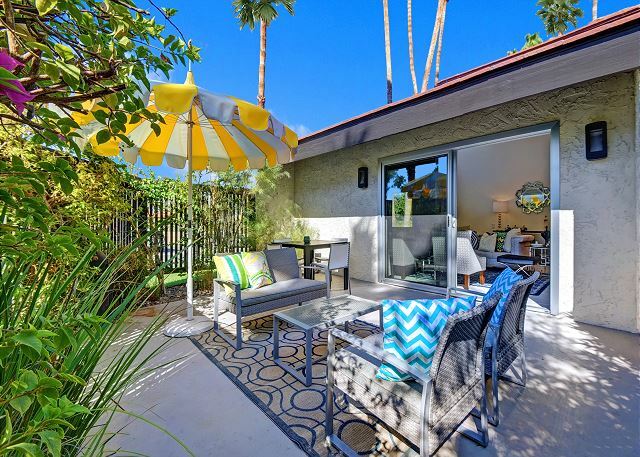 BILTMORE REGENCY, with a South Palm Springs quiet and central location, H3K design, and double master suites is a hidden gem with everything you expect and more from a Palm Springs experience. 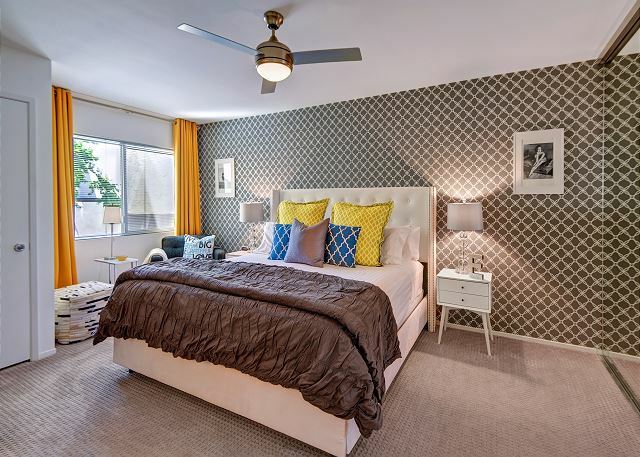 If you love color, high design, and everything at your fingertips you’ll love BILTMORE REGENCY! Our stay at your Glam Condo was wonderful! We loved the decor, the pool, and especially the two master bedrooms! Perfect for us. The condo is located in a wonderful location and had very friendly neighbors. The larger bedroom was very warm the first night although the air was on. We solved it by opening the windows but not sure why that was. We enjoyed our stay here immensely and would definitely stay here again on our next trip to Palm Springs. PROS: The house was very clean and well-maintained. The decor was stunning. A/C worked well although we noticed that it was cooler in the second bedroom than in the master bedroom so we slept in the second bedroom instead because we like it very cool for sleeping. Home was well-stocked with paper products, condiments, dishes, pans, glasses, etc. The condo and the grounds were very quiet at all times so we had no trouble sleeping. Washer and dryer worked great. We loved the big screen TV. There were also plenty of books and board games available. Home is only 5 minutes from Palm Canyon Drive shops and restaurants and only 20 minutes from the El Paseo shops in Palm Desert. Great shopping experiences! Also visited Joshua Tree National Park, just 1 hour away. SUGGESTED IMPROVEMENTS: The teflon pans had deep gouges in them and should probably be replaced. We opted not to use them. The master shower needs a grab bar as the floor is very slippery. The storm door needs repair as it was difficult to close and seems to be falling off the frame. These things were minor and we would definitely stay here again. We enjoyed every second in this beautiful and well equipped home. From check in to check out everything g went very smoothly. Extremely clean and stylishly decorates with every amenity possible made this a perfect place for a getaway. Was smaller than I imagined from the pics....but still was not disappointed. Met all of our needs. Fun colors and the beds were very comfortable. Close proximity to the pool also. Good Times! Thank you. I walked in and my first reactions was "Wow!". This was the most amazing vacation rental I have ever stayed in. The decor was amazing - I felt wrapped in luxury! I will be staying at this property again soon. 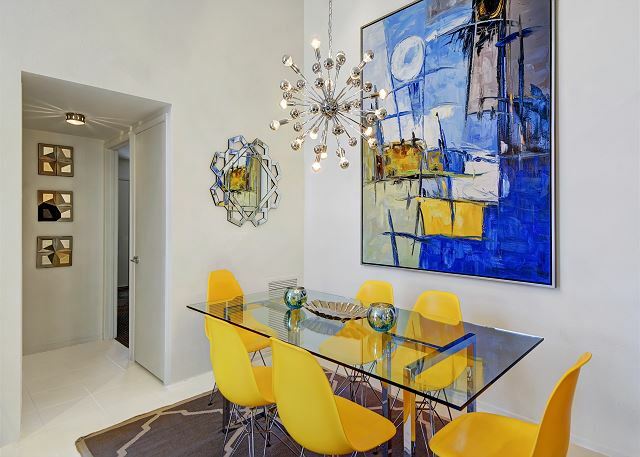 Condo is funky and perfect size for two friends or couples. Great pool area and nice and quiet. The property was wonderful. The outside patio was very appreciated - made our morning coffee so enjoyable. The kitchen was well stocked with essential cooking items. The grocery store was close and convenient. The street lighting is minimal so it made finding the condo initially a bit difficult but by day 2 of our stay no problems. Alex was wonderful and friendly. We had noted a blood stain on a bed sheet which he took very seriously and was mortified that it was there. He removed the sheets. That may be my only recommendation is to update the bedding as the other bedroom sheets had some rips as well. We could hear the tenant above the condo at night in both bedrooms but that can be expected in a hotel room as well. Overall both my friend and I were very pleased with the property and are already planning our trip to Palm Springs in 2018. We were impressed from the moment we walked in the door. The decor was elaborate, tasteful and fun! Kitchen and bathrooms were sleek and modern, very well stocked with everything one might need, (like extra sugar, scotch tape, super glue, spare batteries)! And everything was immaculate and like new condition. The grounds were lushly planted and beautifully kept. The pool was large, crystal clear and perfect temperature. Palm Springs dining and shopping were a few blocks away. We highly recommend a stay here. We enjoyed our stay at the Biltmore property. The place was super clean and fresh and gave us a quintessential Palm Springs experience. Moe was very charming and met us on our arrival to settle us in. The location is excellent - across from the Ace hotel. The grounds are kept in tip top shape including the pool area. Definitely recommend and would stay here again.